Rather than celebrate with a cupcake, I'm chewing on some Macarons. Okay, I'm really not. But for two years now, I've been trying to figure out what would trump the cupcake off its "it" bakegood petestal. Well folks, according to some people in the media, it's the Macaron. Yes, I know. I told you before that the New York Times said that the trend would be whoopie pies, but it seems like the pies just aren't sticking. They aren't as pretty as macarons. Starbucks began selling macarons in its stores in December. And if you keep your eyes open, I'm sure you will see this pastry popping up at more events and stores. Let me know if you spot them! If you dare try and make these cookies at home, here's a recipe from Martha Stewart. It looks a little complicated to me, but maybe I'll try it over the long weekend! Makes about 16 filled macaroons. To make the macaroons: Preheat the oven to 350 degrees. In a medium bowl, whisk together confectioners' sugar and ground almonds. In the bowl of an electric mixer fitted with the whisk attachment, whip egg whites with salt on medium speed until foamy. Increase speed to high and gradually add granulated sugar. Continue to whip until stiff glossy peaks form. With a rubber spatula, gently fold in the confectioners' sugar mixture until completely incorporated. To fill the macaroons: Fill a pastry bag with the filling. Turn macaroons so their flat bottoms face up. On half of them, pipe about 1 teaspoon filling. Sandwich these with the remaining macaroons, flat-side down, pressing slightly to spread the filling to the edges. Refrigerate until firm, about 1 hour. Variations: To make coffee-flavored macaroons: In step 1, add 2 drops brown food coloring to the egg whites after they are whipped. In step 4, blend 1/2 cup macaroon filling with 1 1/2 teaspoons espresso powder dissolved in 1/2 teaspoon warm water for the filling. 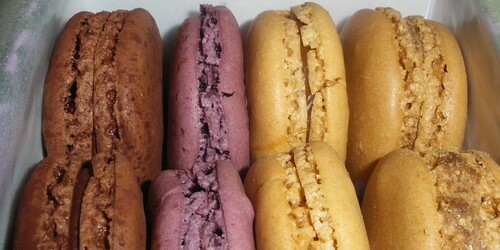 To make cassis-flavored macaroons: In step 1, add 2 drops purple food coloring to the egg whites after they are whipped. In step 4, use 1/3 cup good-quality cassis jam for the filling. To make pistachio-flavored macaroons: In step 1, add 2 drops green food coloring to the egg whites after they are whipped. In step 4, combine 1/2 cup macaroon filling with 1 tablespoon pistachio paste for the filling. I thought they were spray painted hamburgers for a second. I've never heard of them, then again I don't have much of a sweet tooth.